Kate and I spent our “Momday” morning stockpiling our freezer with buttermilk pancakes (my favorite) and blueberry protein pancakes (her favorite). I got this blueberry protein pancake recipe from my friend Jill who came across it in the September 2010 issue of Health magazine, and while it sounded very strange on paper, I decided to give it a try because I’m always looking for ways to sneak protein into Kate’s diet. These are now one of her favorite breakfast foods–she can’t get enough of them! In a blender or food processor, combine oats, cottage cheese, eggs, and vanilla. Blend or pulse until smooth. Gently stir in thawed blueberries. Coat skillet or griddle with cooking spray, and spoon about 3 tablespoons of batter per pancake onto your cooking surface. Cook about 5 minutes per side, or until tops are covered with bubbles and edges look cooked. Carefully turn pancakes over; cook for 3-5 minutes more, or until golden. You should know right up front that these “pancakes” do not have the look or fluffy consistency of regular pancakes–they are much more dense. This is also why you want to keep them on the smaller side (about 3″ in diameter). Also, don’t freak out if your batter turns purple once you add the blueberries; it’s no big deal. Your pancakes may have a bit of a blue-ish/purple-ish hue even after they’re cooked, but that’s also normal. This recipe freezes really well. I make several batches at a time, cool them, and then seal them in freezer bags and pop them in the freezer. Lastly, these pancakes have enough flavor that they don’t need any topping, but if your little one insists on a topping, consider trying plain or vanilla yogurt instead of syrup. YUM! 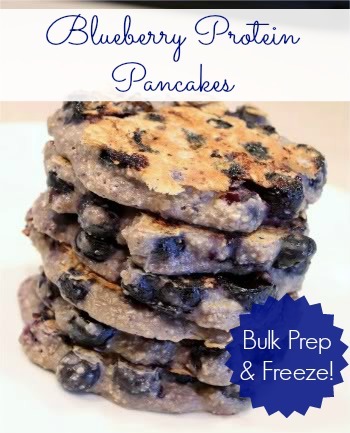 I love blueberry pancakes- I want to try these! I can’t wait to try these! My little one loves pancakes and these sound so easy! I make protein pancakes all the time. Love them! One suggestion – Try adding a 1/2 tsp of baking powder to your mix. It will help give them a lighter, fluffier texture. I also use just egg whites, so that may contribute to a difference in overall texture as well. I use 2 eggs for this recipe, Linda (including yolks). Thanks! Keep the recipes coming! My 14 mos. old thanks you. How do you re-heat them when you are ready to eat them after they’ve been frozen? Do you just put them in the microwave? I am definitely going to try this for Savannah! Thanks D! Thanks for posting this recipe Dusty. I just bought blueberries (on sale buy one get one free) and needed to use them up. This is perfect for using them!! And I love all things blueberry. Yum! Thank you for your comments everyone. You’ll have to let me know what you (and/or your children) think if you give this recipe a try! That’s a great suggestion, Tara, thank you! @Briel–I reheat them in the microwave, but you could always warm them up in a pan on the stove if you’d prefer to avoid microwave reheating. @Diane–I love that blueberries are on sale right now. With as quickly as Kate goes through them my wallet is grateful for those deals! These sound great. I’ll have to try them with Ethan. I saw this post yesterday and made these pancakes today. My boy loves them and I love that I can freeze them. Thanks so much for sharing! I just made them for breakfast and my girls love them. My husband was sceptic first when he saw the ingredients but ate them all up after all and really liked them as well. @Sharla & Jeanne–I’m so happy to hear your families enjoyed this recipe! Thank you for your feedback! I made these this morning and they were a huge hit! My Just-Turned-One-year old gobbled them up and my 4 year old told me they were “the best pancakes you made, Mom” I followed your advice and made an extra batch for freezing. Thanks for sharing! I’ve been making protein pancakes for a while, and have found that you can add baking powder (experiment, 1/2 tsp to 1 tsp should do) to these to lighten them up a bit if you’d like. Hope that helps make them even more yummy! @thatswhatchesaid–So glad they were a hit with your kids! Thanks for sharing! @Cg–Thank you for the tip. I’ll definitely try that the next time I make them!